Ken Onion’s Skinner – Developed through experience with excellence being the goal. For many of you who have zero clue who Ken Onion is regarding knives, don’t be too ashamed. Until a couple years ago, the name would have been completely unknown to the author as well. For now TPF will give some background on one of the most innovative and dedicated knife designers/fabricators that has plied his trade in North America for just over the last three decades. Born in the early 1960’s, Kenneth J. Onion has stated that he has always being interested in knives, yet it was not until 1991 when under the tutelage of a local knife maker, Stanley Fujisaka, that Ken Onion made and completed his first knife. Since then however, Ken Onion has dove into the knife making world head first. In 1996 Ken Onion designed and created a spring assisted opening mechanism, and by 1998 the “Speed Safe” SAO system had been adopted by Kershaw Knives, and Ken Onion was directly working with Kershaw. 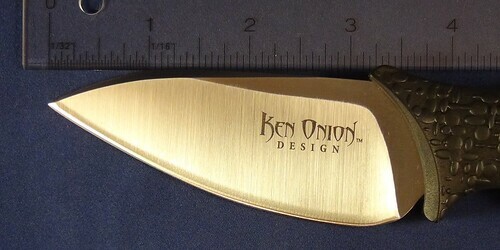 Many of Kershaws successful designs were from Mr. Onion’s efforts and for the most part associated Ken Onion with Kershaw as the two were nearly interchangeable. Nearly two decades after his first “custom knife”, Ken Onion left Kershaw and created his own company, and partnered up with CRKT back in 2010. With more than several dozen knife related patents to his name and the knowledge and experience to create new designs, you can be sure that as long as Ken Onion decides to continue designing and making knives, they will always be top notch in effect. Hawaiian knife maker Ken Onion told us he was working on the ultimate hunting knife, but it wasn’t ready yet. We assumed that he meant he was putting the finishing touches on a prototype, and were we wrong! 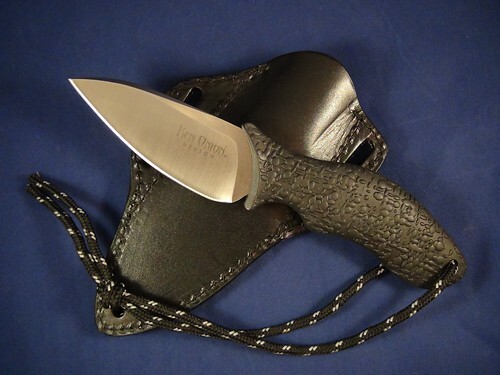 Compact with a nice pancake sheath and lanyard, what does Ken Onion’s Skinner look like? CRKT’s Skinner is designed to be an exceptionally versatile hunter’s tool. The 95mm (3.8″) blade has spine thickness of nearly 3.6mm (0.14″) and is cut from Böhler K110 steel. The blade is a variation of the drop-point profile which really allows for the plain hollow grind edge to be relatively large and flat while seeming to have a large belly (which it does not). Amassing 105 grams (3.7 oz) across it’s 203mm (8.0″) overall length, the Skinner is not a overtly heavy blade for carrying around. The tang of the Sninner is only 3/4 length opposed to a full tang setup. The grip consists of several components which are seamlessly moulded together, primarily the Zytel core and the soft thermoplastic rubber (TPR) outer covering which enhances the “scales” of the grip. The Skinner is the result of numerous years of prototypes and enhancing from user comments and critiques. For control-ability a large choil is inset into the grip shape allowing for refined control. In addition, the large blade allows for the user to have ample thumb room for strong and deft manipulation of the cutting edge which is imperative for skinning. With the attached lanyard for retention, the Skinner allows for continuous, at-ready use. The sheath of Ken Onion’s Skinner blade is remarkable in itself. 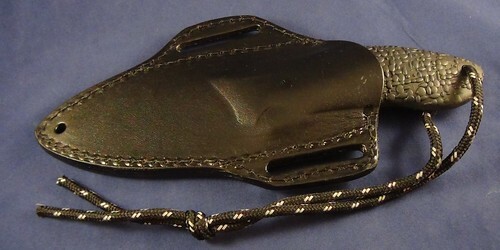 Manufactured similarly to pancake holsters, the sheath is profiled to carry the Skinner on a forward sweeping angle. Crafted from 6 ounce leather and treated to be black in appearance, the sheath masses roughly one third of the blade itself at 60 grams (3.7 oz). The sheath incorporates a profile contoured shape which results in an exceptionally good securing method for the blade. Designed for ambidextrous wearing, the sheath is equally at home for both right and left handed users and the angled design means a more comfortable fit when the knife is sheathed. The Ken Onion designed Skinner knife is manufactured by CRKT under the model code K700KXP and has an MSRP of $89.99 USD. It is available for purchase from retailers such as MilArm Co. Ltd. located in Edmonton, Alberta. Is this knife design Tactical, Practical, or Fantastical? That is for you, the reader, to decide. This entry was posted on December 24, 2012 by M. Duynhoven. It was filed under Blades and tools and was tagged with blade, Columbia River Knife & Tool, CRKT, CSSA, fixed, Hollow Ground, hunting, Ken Onion, knife, Skinner, skinning, TPF, TPF-Online, Zytel.